Spoilers for The Walking Dead Season 7 Episode 4 follow. Rosita Espinosa is fresh off of a harsh break up. On top of that, she also just watched the same man who left her stunned with harsh parting words get his head bashed in by the new villain in town on The Walking Dead. Still, she seems to be sticking with the rebound of Spencer Monroe. Late in the show's sixth season, Rosita starting sleeping with Spencer. The last remaining member of the Monroe family was clearly a bit more attached than she was as he proposed dinner dates and more following their fling. Rosita was not interested. In Sunday's episode, the two seemed to have a bit more of a connection. Of course, they did have some classic married couple banter between them as they argued about methods of survival but, in the apocalypse, that's not so bad. 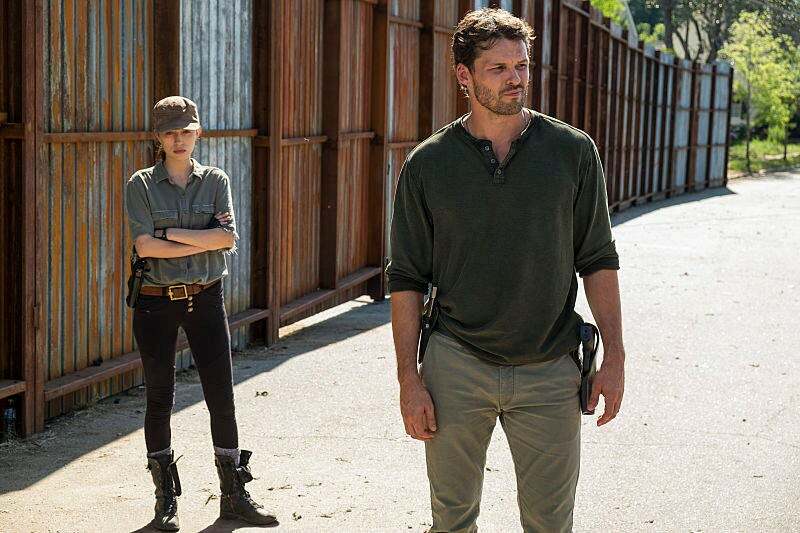 Speaking to both Rosita actress Christian Serratos and Spencer actor Austin Nichols, ComicBook.com asked about the potential future for one of Alexandria's last remaining love stories. "I absolutely think she'll come around," Nichols said. "The thing is is that she's still fresh off of losing Abraham, both as a partner and he's now not alive. It's a double whammy. She lost her relationship and then she lost him, period." That said, Nichols is aware of the fact that his Spencer was at first just someone (or something) to make her feel better. "I think at first Spencer was a warm body and a rebound in a sort of just she needed what she needed and she got it from him but there wasn't anything real happening," Nichols said. "I think as time goes by, Spencer makes weird decisions and he's unpredictable and a little rebellious, but he's a good dude, and I think she can see that in him and she'll come around. I have high hopes for them." "That's cute," Serratos said in response to Nichols' perspective, before she laughed her cruel answer. "I think if she didn't have any interest in him, she wouldn't be with him at all, Serratos said. "She wouldn't be having any sort of interaction with him. There's obviously something there. Whether it's going to amount to anything serious is yet to be seen. Maybe we'll find out in the rest of the season, but I think definitely her focus is survival. It seems as if it's revenge right now, so I think that's definitely something that's not even on her radar, but I think psychologically she wouldn't even be with him if there wasn't some sort of interest there. Whether it would be temporary or serious, I don't know." Looking to The Walking Dead comics for help determining whether or not Spencer and Rosita will become an item on the AMC series, it seems more likely there is an unexpected candidate for fans who exclusively watch the TV show. After Rosita and Abraham's break-up and Big Red's death, Rosita eventually finds herself going to Eugene for comfort. Of course, a shoulder to cry on often becomes more than just that. Serratos has not ruled out the possibility of seeing Eugene and Rosita's love story realized on television.